Why Is It Important to Update MetaTrader 4 to the Latest Build by August 1? MetaTrader 4 was officially released as far back as in July 2005 and went on to become the most popular trading platform in the world. More than 2000 MT4 servers are currently available to traders. Success did not come immediately, of course. It was obtained as a result of constant hard work while we were implementing more and more features and fixing user-reported errors. In order to provide further development and implement new sought-after services, we decided to radically update MetaTrader 4 and concentrated all our efforts on complete rewriting of many critical components in summer 2013. 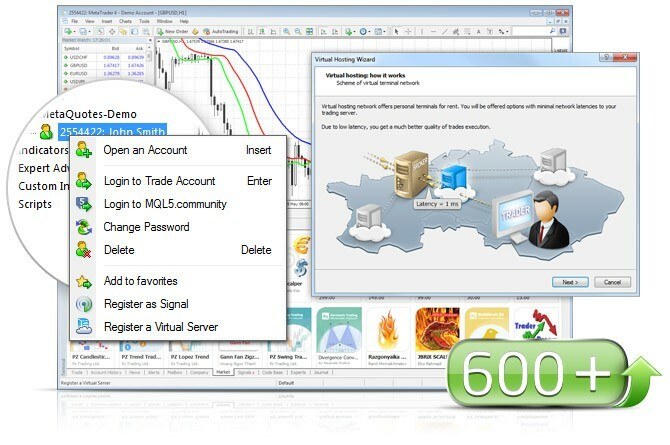 It was a challenging task, but the result was worth it: MetaTrader 4 build 600 containing the fully updated client terminal with the new MQL4 language and the Market of applications was released on February 3, 2014. This was followed by the explosive growth in the number of trading applications uploaded to MetaTrader AppStore - the store of MetaTrader trading robots and indicators. Attention: From August 1, 2014 MetaTrader 4 desktop terminals older than build 600 will be no longer supported. The new opportunities offered by the updated MetaTrader 4 make it unreasonable to stay with older versions of the terminal. The upgrade to the new version is performed safely and seamlessly with all user programs and data remaining intact. Though MQL4 language has been updated up to MQL5 level, previous EX4 programs compiled by build 509 or older compiler remain operable in the new MetaTrader 4. So, what can the new MetaTrader 4 offer you? Let's briefly cover the most critical changes you need to know about. First of all, MQL4 programming language has been completely revised. Its functionality now matches that of MQL5. This means that MQL4 programs work 4 to 20 times faster, while protection of compiled EX4 files is at its high. The syntax of the new MQL4 corresponds to C++. Trading robot developers enjoy all the advantages of the object-oriented programming (OOP), though they are also able to develop applications the old way. MetaTrader 4 has the new MetaEditor providing all necessary development tools – debugging, viewing variables, profiling, code completion, snippets, and more. Moreover, support for DLL and Visual Studio as well as access to MQL5 Storage have been implemented. And of course, the new MetaTrader 4 features the Market allowing users to buy and sell protected EX4 programs. Now, all MQL4 developers can upload their products to the Market integrated directly into the terminal. The store of MetaTrader 4 applications is beneficial both for trading robot developers and buyers. All EX4 programs downloaded via the Market are additionally encrypted and bound to buyer's PC. The number of purchased product's activations is set by a seller, though it cannot be less than five. The buyers are able to check an Expert Advisor in the tester before purchasing it, while sellers can be sure that their products are protected and payment is guaranteed. Apart from trading applications, the MetaTrader Market also offers magazines and books by famous authors on trading and finance. The range of titles is constantly expanding. All books and magazines have a preview version in PDF format available for download. The new MetaTrader 4 also features increased trade execution speed. We have significantly improved the modules responsible for generation and support of trade flows in the terminal and trade servers. This has sharply reduced delays in executing trade requests, while "trade context busy" issue has been solved completely. Now, you can work with websites directly in MQL4 without using DLL libraries. New WebRequest() function allows sending GET and POST requests from an MQL4 program only to the websites the user has specified in the terminal settings. This is a brand new class of trading robots able to analyze and parse the contents of news sites, issue automatic reports, etc. It is also possible to choose and subscribe to trading signals directly from an MQL4 program. The new group of functions for managing signals allows processing trade results of all signals available for subscription and choosing the best one according to your preferences. This opens the way to yet another class of trading robots using preset algorithms to automatically track and subscribe to the best signals. Of course, it is impossible to cover all important changes in brief, since Build 600 announcement alone contains 60 points, while 30 additional points have been added to Build 646 one. The new MetaTrader 4 has become not only more exciting but also more reliable for traders, since we have fixed many old errors while rewriting and testing the platform. Finally, we should mention yet another new feature - the virtual hosting for round-the-clock automated trading. In the coming builds, you will be able to rent the virtual copy of your terminal with minimal network latency to your broker's trade server directly from MetaTrader 4. Virtual Hosting Cloud is a server network located all around the world and supporting special versions of MetaTrader client terminal. Selection of a suitable location, service plan, payment and synchronization is fully automated. VPS servers are not needed anymore. As you can see, we are constantly working on improving MetaTrader 4, and we are not going to slow down. Upgrade to the New MetaTrader 4! Although MetaTrader 4 trading platform enjoys well-deserved recognition, we intend to continue adding new functionality and useful services for traders. Update your terminal right now, without waiting for August 1, and discover the new features. Your convenience is our priority! To avoid critical completion of programs, the previous version compiler handled many errors in the runtime environment. For example, division by zero or array out of range are critical errors and usually lead to program crash. The new compiler can detect actual or potential sources of errors and improve code quality. In this article, we discuss possible errors that can be detected during compilation of old programs and see how to fix them. The new version of the MetaTrader 4 terminal features the updated structure of user data storage. In earlier versions all programs, templates, profiles etc. were stored directly in terminal installation folder. Now all necessary data required for a particular user are stored in a separate directory called data folder. Read the article to find answers to frequently asked questions. We continue to enhance the Signals service, improve the mechanisms, add new functions and fix flaws. The MetaTrader Signals Service of 2012 and the current MetaTrader Signals Service are like two completely different services. Currently, we are implementing A Virtual Hosting Cloud service which consists of a network of servers to support specific versions of the MetaTrader client terminal. Traders will need to complete only 5 steps in order to rent the virtual copy of their terminal with minimal network latency to their broker's trade server directly from the MetaTrader client terminal.